This post circles back on the recent Headwinds and Tailwinds presentation I gave at the Northwest Economic Research Center’s forecast breakfast. It also ties directly into the previous post on Oregon’s industrial structure overall. The biggest high-tech takeaway from an industrial structure point of view is that Oregon’s historical strengths are not expected to lead growth moving forward. Oregon’s high-tech legacy and our regional economy’s comparative advantage lies in hardware manufacturing, with semiconductors being the most prominent. This portion of the high-tech industry will continue to generate considerable economic output, both directly and indirectly given large-scale operations with supply chains, and the clustering of a skilled workforce. However, job gains over the next decade are unlikely to follow suit due to ongoing productivity increases. To the extent that a few of these firms do add jobs, there are others scaling back. As such, Oregon’s high-tech growth will be driven by the software side of the industry. Over the past decade or so, employment at software firms has increased considerably. We’re talking 4.5-5.0% annualized job growth over the past 10 to 15 years. This is by far the fastest growing industry in the state during this time. The second fastest growing industry is health care at just under 3% annual growth. That said, employment at software companies remains a relatively small slice of the economy. It has gone from around 1% of all statewide jobs and 17,000 workers back in 2006 to nearly 1.5% of all statewide jobs and over 27,000 workers in 2017. However, as our office previously discussed this software growth is a bit different than on the hardware side. First, software has not been Oregon’s comparative advantage like hardware over the decades. Just look at location quotients for semiconductors (6.3) and software (0.9). That means Oregon’s concentration in semiconductors is 6 times as large as the U.S. average, while our concentration in software is actually 10 percent smaller than the U.S. average. Second, we’re seeing a number of outposts or satellite offices rather than headquarter operations and research hubs. Today this is not a problem. In fact the growth in these new, high-wage software jobs is all good news. In particular they are diversifying our economy and adding a component that hasn’t really existed like this previously. However, one concern may be that these outposts are more vulnerable during the next cycle when the spokes are cut and operations are consolidated at the hub. This may not happen, but it has certainly been the case in hardware in recent decades. Oregon, being the main research hub, has benefited tremendously as a result. All of that said, at times we can lose the forest for the trees. The above looks at employment through an industry lens, or based on what the company actual does or produces. One thing our advisors have been, umm, advising us to do in recent meetings is to dig not just into tech industries but tech occupations. This is something we previously did a few years back and I have updated that work using ACS data instead of OES. There is at least one key reason why tech-related occupations are preferable to industries and that is the fact that tech-related jobs are everywhere, and in nearly every firm. It may just be one network administrator or it may be a whole team of engineers, but tech-related occupations are spread across the entire economy today. So measuring just tech jobs at software companies misses the broader impact. And it also gives short shrift to one of Oregon’s key comparative advantages: the ability to attract and retain talent. Oregon’s high quality of life and strong regional economy helps local employers recruit top talent. This goes specifically for high-tech companies but also for hospitals, apparel and design firms, heavy manufacturers, the public sector and so on down the list. 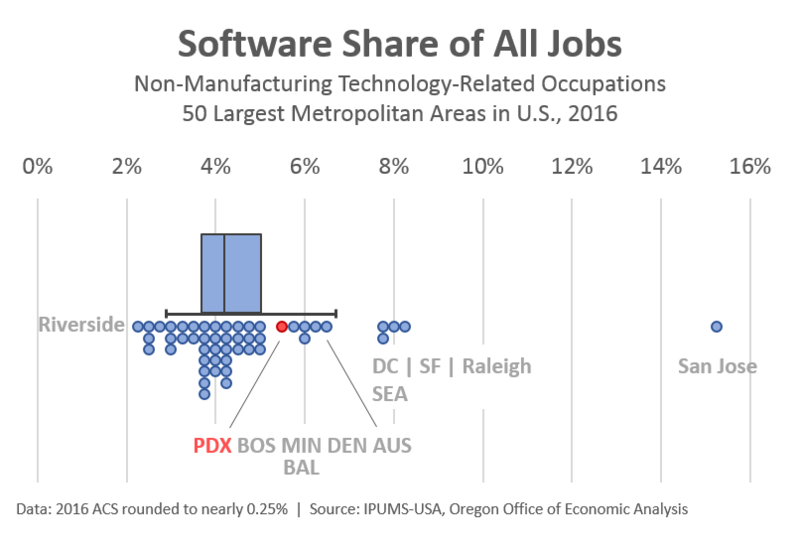 In looking at tech-related occupations, Oregon and the Portland region do tend measure higher than examining industry-only figures. Specifically, the Portland metro area ranks 11th highest among the 50 largest nationwide in 2016. Now, while Portland ranks just ahead of Atlanta, Columbus, and Dallas, it does rank a bit lower than many of the nation’s leading tech hubs. Also note that while these tech-related jobs are growing as a share of all jobs over the past decade, Portland’s relative ranking has remained essentially the same. Software jobs are increasing everywhere, not just along the West Coast or in tech hubs. And while Oregon and the Portland area are seeing strong gains, they’re not significantly stronger than the growth seen nationwide or in other large metro areas. In digging into these jobs a bit further, here are a few worker characteristics that stood out to me. These tech-related occupations in the Portland region are 74% male, 26% female, compared with all other occupations being 52% male, and 48% female. Tech employment is 77% non-Hispanic white, matching the other occupations (76%). Tech’s educational attainment is nearly double that for other occupations. The share of tech workers with at least a bachelor’s degree is 69% compared to 38% for all other occupations. Bottom Line: High-tech jobs in Oregon are expected to increase, even as the sector transforms. Hardware remains a key economic strength, although employment is not increasing on net. The software growth diversifies our regional economy. However the impact of tech-related occupations is broader than software firms alone. Given the prevalence of outposts, some of this software growth is an economic tailwind with risk. 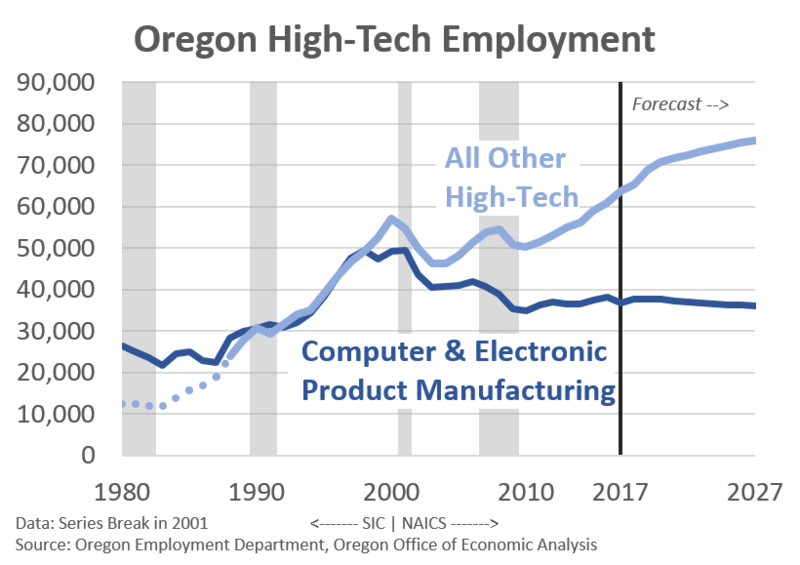 The key to the long-term outlook is for Oregon to develop a critical mass of software and tech-related workers, so that the talent remains to rebuild the sector following the next downturn of tech cycle. To this point, every single one of our advisors believes we have reached critical mass. Our office largely agrees and the numbers support it. 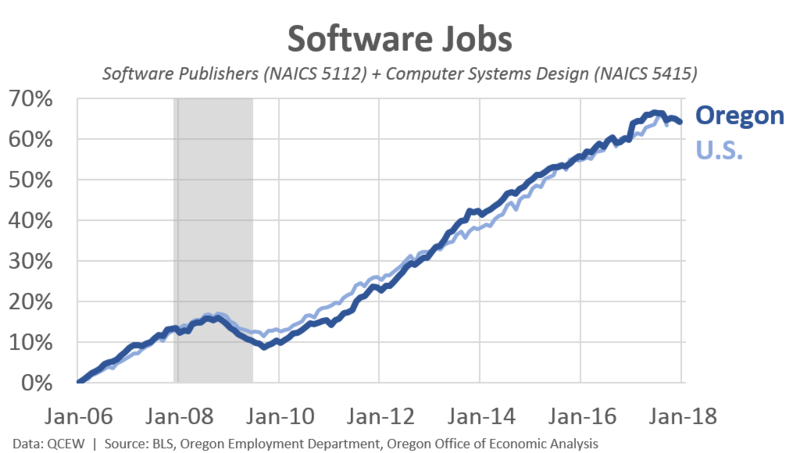 However, given the relative newness to the software industry in Oregon, we would also like to see how these trends behave over an entire business cycle to know for sure. But we do know that Oregon’s ability to attract and retain skilled workers is a comparative advantage moving forward.